While most mountain bike enthusiasts pay close attention to their arms and body as they race down a trail, the feet are doing most of the work. They’re are used continuously throughout a ride, regardless of how challenging the trail. Your feet help to build up power and speed, carve through tight turns, and give you control of the ride. With all that responsibility, riders should treat their feet to a high-quality pair of shoes. The right pair of shoes can make or break a ride. 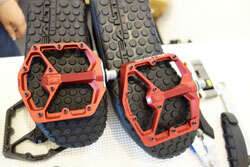 Manufacturers carefully design mountain biking shoes to fit the particular needs of the rider. Essentially, shoes are built to make every stroke of the pedals an effective one while remaining comfortable and pleasant to wear. There are two basic types of shoes for mountain biking. One is designed for flat pedals while the other is for clipless models. Both have their advantages and disadvantages. The market is filled with options for both. Regardless of preference, it’s always a good idea to have a dedicated pair of shoes for riding. The perfect shoes will improve performance while keeping you safe and comfortable no matter where you ride. Flat pedal shoes are the most basic options available. If you’re just starting out in the sport, you’ll more than likely use these. Flat pedals are made out of a tough metal and are large enough to accommodate your foot. Some models feature a support strap or cage to keep the foot in position, however, this is typically seen on older models rather than newer bikes. Shoes made for flat pedals are hard to distinguish from standard shoes. However, they do contain a tough and rigid sole. This helps to keep the foot steady and in prime position for the best transfer of energy. Grippy outsoles are a common feature that will help you keep hold of the pedals as you fly down a trail. The biggest advantage of flat pedal shoes is that they are very versatile. They can be worn virtually anywhere because they don’t feature any extreme components. Many riders prefer these to clipless shoes because they are easier to control. If you need to bail, it’s only a matter or removing your feet from the pedals. Unfortunately, these aren’t the best shoes if you partake in downhill riding. While they do have grippy soles, there’s nothing keeping you attached. They don’t provide the best control of the bike when you need it most. Because of this, flat pedal shoes are often regarded as the best choice for casual or cross country riding. 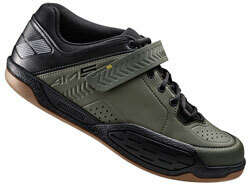 These shoes from Five Ten are made for all types of mountain biking. They feature a unique Stealth Mi6 rubber throughout. This material is very durable and will keep your feet protected from harm. In fact, the shoes have added protection around the toe and a removable insole for comfort. The midsole is stiff, ensuring that your foot is in the prime position for power and performance. The outsole is designed specifically to keep contact with the pedals, making it a great option for any type of rider. Designed to look like a casual sports shoe, no one will ever know that these are made for riding. They’re stylish, yet very effective on the trail. They have EVA cushioning inside and a unique Poron heel pad. This pad absorbs the shock of every hard landing, reducing pain and discomfort. The Megagrip outsoles latch onto any surface. A special grip zone is made specifically for flat pedals and puts the foot in a better position for a great ride. 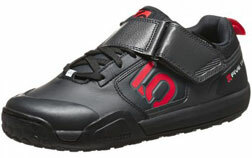 The Freerider bike shoe from Five Ten is a separate option from their Contact line. It is designed to look like a standard sneaker. However, it utilizes the Stealth S1 rubber for better grip onto the pedals. The upper is made from a combination of high-quality leather and resilient fabric. A lace-up enclosure provides a snug fit while keeping the laces out of the way. It’s available in a slew of eye-catching colors, so there’s an option for every rider. Sophisticated and polished, these shoes from Giro are ideal if versatility is what you’re after. It’s designed to be used with either flat or clipless pedals. The outsole is made from Vibram rubber, which provides more than enough traction. It’s moderately stiff to improve stroking performance but still allows you to walk comfortably up a trail. The footbed is molded from EVA for more comfort while the protected non-slip laces create a custom fit. The Links sneakers from Teva came from a collaboration with respected mountain biker Jeff Lenosky. Every aspect is carefully thought out to improve performance and comfort. The outsole grips flat pedals for better control while the ShocPad makes landings more bearable. 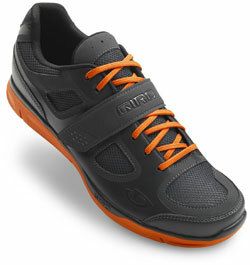 The protective heel wrap and laces create a secure and pleasant fit. The entire upper is covered in a unique technology that prevents absorption of water. This means that your feet will stay dry and cozy wherever your ride takes you. Despite their name, shoes for clipless pedals are designed to work with cleats that clip the shoe to the pedal. Designed for experienced riders, clipless systems offer better control and power when compared to their flat counterpart. These shoes are typically more firm to position your foot perfectly. Thanks to the built-in cleat, your foot will be in the optimal position each time you make a stroke. The unique thing about choosing a shoe for these pedals is that you need to pay attention to compatibility. Not every cleat is designed to work with every pedal, so it’s important to pay attention to brand compatibility between the shoe and the pedal. Mountain biking shoes for clipless pedals are popular because of the control and performance boost they provide. The shoes place your foot in the right position to get the most out of every stroke and prevent mishaps. On extremely technical trails, the cleat will prove to be beneficial as you navigate because there’s no worry about becoming disoriented on the bike. The shoes also help to give you control during airtime. Since you’re attached to the bike, you can make it go where you want. For new riders, shoes for clipless pedals can be a big undertaking. It takes a bit of getting used to. Most riders will lose balance and fall over the first few rides. It’s important to get used to being attached at all times and understand how to detach at a moment’s notice. If you should ever find yourself in a precarious situation, inexperienced riders may find it difficult to bail. Made for downhill riding, these shoes from Five Ten utilize tough materials. The upper is comprised of synthetic leather and polyester. It’s treated to be hydrophobic inside and out. The streamlined design is topped off with a combination of velcro and lace. The laces create a snug fit and are protected by a hook and loop system. The cleats are recessed and surrounded by thick rubber with incredible traction. It’s a bit pricier, but these shoes are sure to provide years of incredible riding. These shoes are made for versatility. They have the appearance of athletic shoes but still house space for a cleat in the sole. Despite this, the shoes can be worn on flat pedals or cycle machines. Made entirely of slick synthetic material, it’s incredibly stylish and comfortable to wear. The footbed is molded to support the arches and add rigidity. The inside also has an anti-microbial treatment to keep the feet fresh. The sole has a deep channel for redirecting water and keeping you stable. Compatible with SPD cleats, these shoes from Shimano are made to be comfortable on and off the bike. The great thing about these shoes is that they’re very friendly to novice riders. 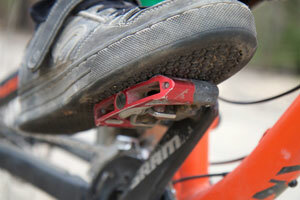 A cleat positioner cap makes the switch from flat pedals a bit easier. Synthetic material and mesh cover the upper section of the shoe for durability and air circulation. A protected lace closure system allows you to get the perfect fit and even tension for a comfortable ride. Another great option from Shimano, these shoes are a bit more rugged and suited for downhill riding. The outsole is made from raised synthetic rubber and protects from abrasion. It has improved grip and is also has a fiberglass-reinforced shank to make the shoe more rigid. Laces are used to achieve a snug fit and work with the padded tongue to ensure that your feet and ankles are always comfortable. A single strap keeps the laces secure and safe. Whether you’re looking for shoes that work with flat pedals or clipless ones, there are numerous factors to consider. It’s important to consider your particular riding style and regular trails to choose the appropriate pair of shoes. If you prefer one style of riding over another, you can benefit from choosing a pair of shoes designed to handle particular obstacles. 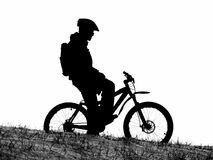 Typically, mountain bike shoes are made for cross-country riding or downhill riding. Cross-country shoes utilize lighter materials. As a result, these shoes don’t offer a lot in terms of protection. They’re all about speed. 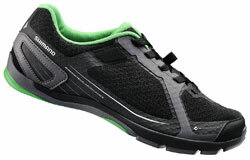 The stiff sole enhances power transfer for speeding through the trail. Downhill shoes are much more rugged and made for all types of terrain. They are often outfitted with protective panels like a toe cap to keep you safe. Areas of increased flexibility in the sole are also included for hiking. When compared to cross-country shoes, these varieties are more casual and can be worn off the bike without anyone noticing. One telltale sign that a pair of shoes are designed for mountain biking is the enclosure system. Manufacturers use velcro and plastic ratchet systems to get the best fit. The combination of durable plastic and easy velcro secures the shoe quickly and easily. While some brands do use lace, it’s known to stretch out, become damaged, and get caught in the chain. If a shoe does use laces, they are often specially made for improved durability. Shoes for mountain biking shouldn’t fit the same way as casual everyday shoes. They need to be snug and secure to keep riders safe. It’s a good idea to get shoes professionally fitted to ensure the best performance. With that being said, shoes should still be comfortable to wear. Extra features like gel padding and insoles make them more pleasant to wear. 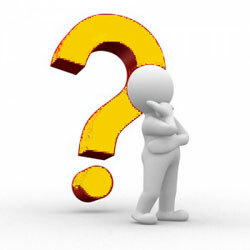 The amount of stiffness the shoes have can also play a role in comfort. While stiff shoes are great for long descents, they’re not suited for hiking or climbing. Like with any outdoor shoe, treads are important. With flat pedals, treads can be the difference between losing control and holding on. Aside from the actual ride, you’ll want to choose a tread that can safely support you as you walk to the trail. With clipless shoes, pay attention to how much the cleat protrudes. Most mountain biking shoes have a recessed cleat surrounded by intentional treads to keep you steady on slippery surfaces. To say clips are better than flats on downhill racing is a bad assumption. It really depends on the rider preference and the course.